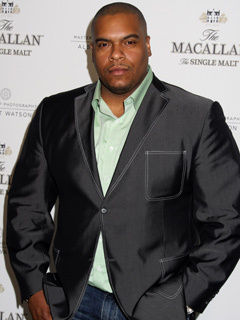 While working as a bodyguard, 6-foot-3-inch actor Sean Ringgold found himself in front of the camera on BET's video Web site, BLAST, and the rest is history. He continued to guard an impressive roster of celebrities while pursuing his acting career, appearing in several music videos and TV commercials. In 2006, he landed the bit part of OLTL's Shaun, bodyguard to the now-MIA Vincent. The under-five soon became a recurring role, and three years later, Shaun has a brother, Greg, a sister, Destiny, and even a love interest in Rachel. Although his nickname at BET was "Big Head," Ringgold is anything but boastful. "I've learned humility and to be grateful I have a job," he says. "Do the best you can and keep on pushing forward. When those big paydays come, they come. Otherwise, keep your mouth shut and be grateful you got a job." His official Web site is www.seanringgold.com. Has appeared in music videos for Robert Randolph & The Family Band and Elephantman. Is a three-time New York State Arm Wrestling champion. His past jobs have included construction, car sales and marketing. His former bodyguard clients include Tom Cruise, LL Cool J, Queen Latifah and Ludacris. Has appeared in commercials for Burger King and Dunkin' Donuts. Sean Ringgold (ex-Shaun, OLTL) joins Netflix’s ORANGE IS THE NEW BLACK in season 4, available for steaming now. “Hey guys, I’m happy to be appearing on @OITNB tomorrow in episodes 6 & 10. Blessed to be a part of this Show,” he tweeted. Sean Ringgold (ex-Shaun, OLTL) and his real-life leading lady, television journalist Nicole Johnson, became the proud parents to a daughter, Skylar Elaine Ringgold, on April 1. OLTL's Sean Ringgold Returns Today! OLTL's Shaun (Sean Ringgold) shows up in Llanview on today's episode, June 20, only to find that his little sister, Destiny, has been raising Drew without any help from Matthew. Sean Ringgold (Shaun) has decided to accept Prospect Park's offer to stay with OLTL.